Relaxed jersey top made from a comfortable and soft cotton/modal/elastane blend, with four gorgeous printed patterns that scream summer, beach & sea. This sleeveless shirt is a joyfully combined well-being model that wins you over with subtle details and radiant shades. 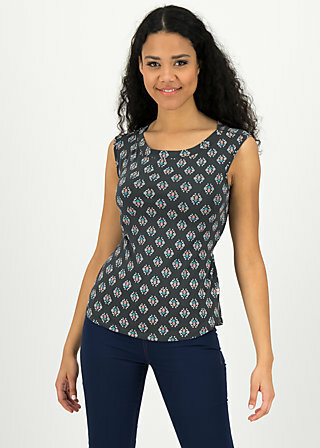 The plunging neckline that's ready for daily wear with wide panels, fine trim along the armholes and the flattering fit make this pattern-heavy summer top an uncomplicated favourite for everyday wear. Refined details: Along the waist, a narrow band has been incorporated in to the side seams that is tied in the back to form a bow, the belt acts as a pretty eye-catcher that flatters your figure - a textile flavour explosion from Blutsgeschwister!